Aberdeen is Scotland's 3rd largest city and is fondly known as the 'Granite City' or Silver City with the Goldens Sands' for its majestic silver/grey buildings that adorn the city and the city's coastline. It is also known as the 'Oil Capital of Europe' and the 'Dallas of Britain' for its North Sea oil - one of Scotland's great assets. There is so much to see and do in Aberdeen, for relaxation, an injection of culture, education and fun. Musuems and galleries in Aberdeen include Aberdeen Art Gallery, Provost Skene's House, Aberdeen Maritime Museum, His Majesty's Theatre, The Music Hall and more. For kids (of all ages - including adults!) there is the Storybook Glen, Doonies Farm, The Satrosphere, Codona's Fun Beach and the plethora of activities at the Beach Leisure Complex. 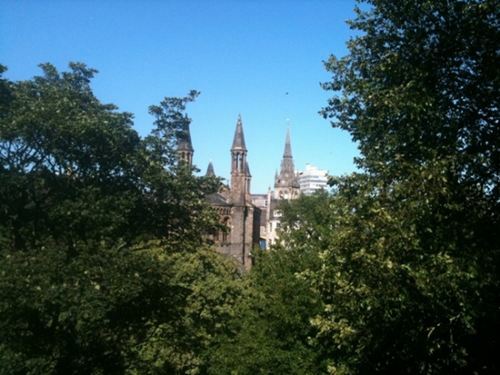 The Parks in Aberdeen are stunning and complement the beautiful walks along the River Dee. One of the most popular parks in Aberdeen is Duthie Park. The park was formally opened on 27th September 1883 by Princess Beatrice who was visiting the city to open the Sick Children's Hospital Bazaar at the Music Hall. Once of the most striking aspects of Duthie park is the David Welch Winter Gardens - Scotland's 3rd most visited garden! Contained in this area is the Tropical House displaying South American plants such as the Bromeliads, Orchids, Gingers and Aroids. There is the Arid House, Japanese Gardens, Floral Courtyard, Terrapins and Turtles in the Hothouse along with a gift shop and plant sales shop too. In additional to admiring the gardens, there are boating ponds for sailing model yachts and remote controlled boats, lovely walks and ducks to feed. A swing park and artistic woodcarvings to clamber over, or simply relax in the sun and have a kick about. Aberdeen is becoming one of the best places to shop in scotland.In addition a huge plethora of independent food, gift and clothing shops and boutiques, Aberdeen has some amazing shopping centres including the relatively new Union Square plus the Academy, Bon Accord and St Nicholas Shopping Centres. Known as 'Scotland's Food Larder' for very good reason. Aberdeen is surrounded by lush countryside and rich waters that are home to the finest of Scotland's food sources. From Aberdeen Angus Beef to Aberdeen Butteries - come and discover fantastic restaurants and deli's serving up the best there is. A day out in Aberdeen or weekend break in Aberdeen is good for the soul! Enjoy Aberdeen'many attractions, Aberdeen's great restaurants and wine bars and fantastic places to shop.